During the Songkran Celebrations in April this year I met a group of people from the Banglamung Home for the Elderly who were visiting the Fountain of Life Children’s Centre. The group invited me to visit their home, which I did a few weeks later. I was very impressed with the home and therefore asked if the PILC could assist them with anything. I received a request for assistance in purchasing two washing machines. The PILC issued a cheque valued at 17,400 Thai Baht soon after the request was made. 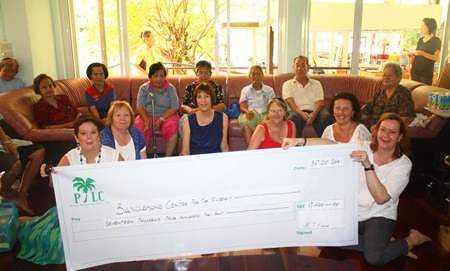 The PILC formerly present a cheque valued at 17,400 Thai Baht to the Banglamung Home for the Elderly for assistance in purchasing two washing machines. On Wednesday 30th October a group of ladies from the PILC visited the home to formerly present the money for the purchase of the washing machines. The Banglamung Home for the Elderly is located in lovely surroundings and can accommodate approximately 300 people who are cared for by 55 staff. Normally the PILC channel assistance to underprivileged children, so today it was a delight to assist the elderly for a change. Is fat in your diet good for you?